Floridian black metal outfit Ampütator originally released the furious and scathing Deathcult Barbaric Hell back in 2007 on cd and cassette. To gear up for the May 18th Greyhaze Records reissue of the vinyl LP, which has since been remastered for this occasion, we are hosting an early stream of the entire album. 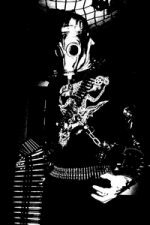 Buzzing guitars with black and thrashy riffs, blastbeat assaults, and caustic vocals – it’s nonstop warring barrage on the raw and very brutal side of things. If you missed out on the original, there’s no better opportunity to catch up than the present. The stream can be found at the bottom of the page. If you dig it, the LP can be pre-ordered HERE.